After assessing the damage in Troy, the National Weather Service has determined that a tornado did, in fact, hit Troy Sunday morning. 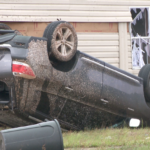 Chief Scientist at NWS Kevin Laws says that it was an EF-1 tornado with about 95 miles per hour winds that hit the Hunter’s Mountain Mobile Estates trailer park. He’s grateful that his damage wasn’t worse. Hubbard ‘s home suffered only a broken window, which was much less compared to his neighbors only a feet away. The NWS arrived in Pike County Monday morning. “Part of the tornado touched down right here the mobile home, this park, this is where the tornado actually started,” Laws says. After going through the damage, the NWS confirms it was a tornado. Recovery efforts are also ongoing. The Salvation Army and Woodmen International are among the organizations assisting in recovery efforts and helping those in need. “It’s just very impressive that neighbors come out to help neighbors so this recovery is really going very fast because everybody is helping each other,” Director of the Pike County Salvation Army Kim May says. Laws says those who remained in their homes Sunday are lucky to be alive. “There was plenty of lee time with these warnings, and we just encourage these folks to keep up with the weather, stay informed, and heed those warnings,” Laws says. Pike County EMA director Herbert Reeves also says the American Red Cross has made provisions for people to have housing tonight so they can get settled in for whats to come. The NWS also confirmed that a total of 3 tornadoes hit Pike County during Sunday’s storms.